- Woven Patches have a wide array of uses beyond apparel. Think of a woven patch as you would an embroidered patch, only with much more intricate detail. Woven patches can replace embroidery when intricate detail is needed. Iron-on woven Patches/Badges/Emblems for garments. Perfect for Jeans, T-Shirts, Shirts, Jackets, Vests, Hats, Backpacks and more! Woven Patches We are reckoned as one of the best Manufacturers of Woven Patches in India. 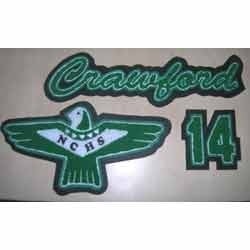 We offer Woven Patches in a wide range of designs, colors and sizes. We deliver high quality Woven Patches by using A-grade raw material. We also provide customized packaging facility as per the specifications of the clients. We are actively engaged in manufacturing and supplying an extensive assortment of Woven Labels to the patrons, which are designed and developed by our skillful team of expert workers, who hold an immense experience in this domain. These products are designed and crafted on the basis of optimum quality and skin-friendly fabric. Being a quality oriented organization, we are involved in providing supreme quality range of Computerised Woven Patches. **Prices may vary depend upon the size, color and design of the product. Fostered with enormous business understanding of this realm, we are involved in presenting a broad consignment of Octopus Patch Badge. 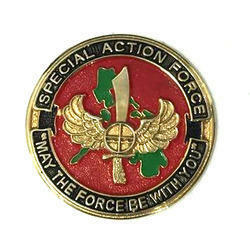 A Woven Badge is used as an accoutrement, often containing the insignia of an organization, which is a simple means of identification. They are also used in advertising, publicity, and for branding purposes.